The three day camp will be divided into three sessions each day, with a morning session from 9:00 – 11:30 a.m., an afternoon session from 12:30 – 3:00 p.m. and an all-day session from 9:00 a.m. – 3:00 p.m. with lunch included from 11:30 a.m. – 12:30 p.m. The three day camp cost ranges from $395 for full day sessions and $210 for half day sessions. Campers wishing to attend the full week can purchase a full week all day package for $525. 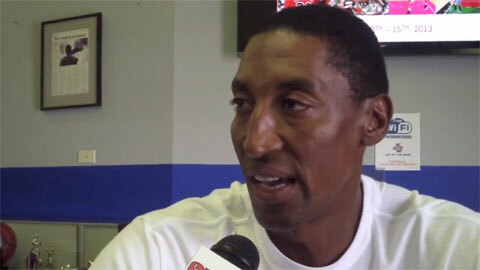 After years of participating in basketball camps across the country, Scottie Pippen decided to host a basketball skills camp of his own. While out in Deerfield, IL, at the Joy of the Game facility in 2013, the six-time champion spoke about why it was his time to take the reins. Scottie Pippen is a retired guard/forward who is most remembered for his time with the Chicago Bulls in which he helped lead the team to six NBA championships. He was named one of the 50 Greatest Players in NBA history during the 1996–97 NBA season. If you would like to book NBA players like Scottie Pippen for a speaking engagement or appearance, you can contact Scottie Pippen’s agent for speaker fees at PFP Talent or call 800.966.1380.